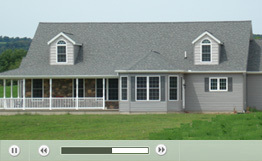 F&N Homes is a custom home builder located in Bloomsburg, Pennsylvania. For more than twenty years, F&N Homes has specialized in providing top quality modular construction throughout central Pennsylvania. According to industry sources, the number of modular construction projects has doubled over the last ten years, as the advantages of modular building become more widely recognized. Modular buildings are of superior construction and can be custom designed to meet any specification. A modular home can be built in about half the amount of time it takes to construct a traditional, or stick built, home. Modular construction is also cost-effective, providing an estimated 15-30% savings over stick built construction. F&N can make any modular building a “green” building, incorporating features and using building materials that minimize impact to the environment. F&N Homes is a family owned business, operated by people who understand the needs of each of our customers. When you work with F&N Homes, you work directly with the company president, Scott Yorty, a certified modular home builder. All of our employees are experienced builders, with an average of twenty years of construction experience. F&N builds homes using modules that are made by manufacturers that we know and trust, ensuring that every home we build is of the highest quality. Custom design is easy and affordable. We have a wide variety of standard floor plans from several top quality home manufacturers that we can modify to meet your exact specifications. Alternatively, you can bring us your own set of plans or just a good idea and we will work with you to design and build the custom home of your dreams. Our goal is to help you realize the benefits of modular construction. We work with you and guide you through every step of the building process. F&N will help you make quality choices that meet your needs and your budget. We guarantee that you will end up with the right home at the right price. If you are looking for a home builder in central Pennsylvania with experience and a proven track record of customer satisfaction, send F&N Homes a message or call us at 570-753-2440 to set up an appointment. Read about the advantages of custom modular homes. F&N Homes is licensed by the Commonwealth of Pennsylvania (PA034466). F&N Homes has been designated as a “Distinguished Builder” by several premium prefabricated home manufacturers and is a member of the Pennsylvania Builders Association and the Central Susquehanna Valley Builders Association.